As many people are aware, the days are getting shorter, which stinks for those who work at night and sleep during the day. Less daylight means less time to run or do outdoors activities while the sun is still out. Recently, though, I decided not to let the lack of sunlight stop me from doing activities I love. Plus, when you are the only one awake at 3am, what else is there to do? Hence, I started running at night. If you have never experienced night running, you might not realize that when the moon is out, it provides more light than you would think. And once your eyes adjust, there is enough light to run in (I need to eat more carrots).Then again, if clouds roll in, and hide the moon, you have a problem, as witnessed by the scrapes and bruises on my knee and elbow from tripping (it was the leaves on the grounds fault though, not mine). 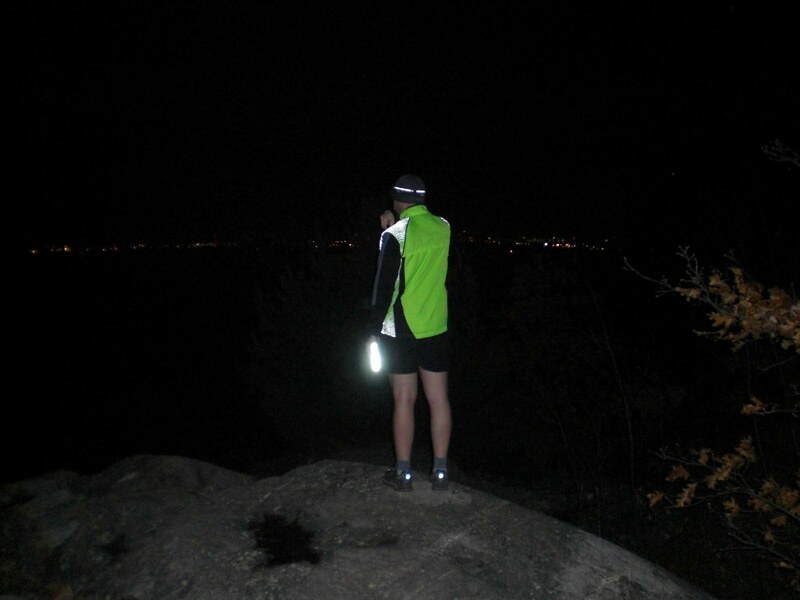 There are definite perks to running at night or in the dark (depending on the time of day). There are fewer cars on the roads, which is nice for me, because route 308 is not a nice road to run along with cars which are flying. I do, however, choose my routes wisely when I run in the dark, because runners or walkers are not seen as easily by drivers. I stick with the back roads where fewer cars generally drive. The feeling of night running is much different than during the day. You really feel like you are the only one awake (and, probably are if you are running at 3am). I do have a couple of helpful hints for those of you who are forced to run at times there is no sunlight, or at night. 1. Wear lots of reflective gear. Night Gear has some fantastic products on the market. It really is for your own safety, because a runner blends in with the darkness and when cars do pass, they don’t see you. I have reflective gloves, reflective leg bands, and a reflective vest. It may sound excessive, but believe me, cars never miss me. This does not only relate to running. 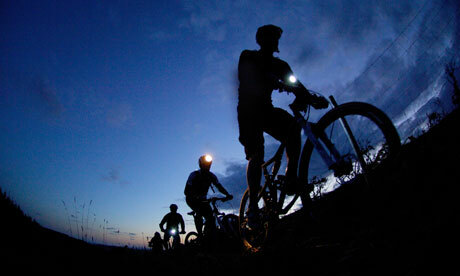 For biking, it’s a good idea to have a bike lamp, and there are lots of reflective cycling jackets out there. 2. Wear a head lamp. If you are ever driving through Dutchess county and pass a crazy runner at 3am with a head lamp, it’s probably me. I have a smaller headlamp now, but plan on purchasing a larger, all weather lamp (that website has some great stuff). This way, I do not need to rely on the moon and the possibility of it disappearing behind clouds as my light source for runs. 3. Stick to roads which have street lamps, if you can. Unfortunetly, I live in an area where the sidewalks are poorly lit, and the sidewalks themselves are in poor condition (and covered in leaves). 4. This is a safety tip for running in general: always bring some sort of identification with you. Whether it is a scrap of paper with your name and number of a close friend scribbled on it, or a Road ID product. I recently ordered a wrist sport ID band after my last mishap on my bike. You never know when you are going to have an accident–why else are they called accidents in the first place? 5. Run routes you are familiar with. Deciding to run in foreign territory in the dark is not the best idea, believe me, I’d be one to know.